Bike lanes that continue all the way to the intersection. Requiring bikes to make left turns from the right side of the road. 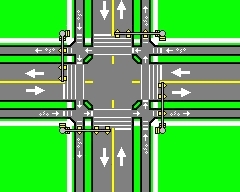 Bike paths forming the fifth and sixth legs of intersections. Two-way bike lane on a one-way street. Tree plots between the street and the bicycle sidepath. Tree plots between the sidewalk and the street. Tree plots between the sidewalk and the bicycle sidepath. Approaching bicycles are invisible to vehicles waiting for left turns to clear (figure 3). The bicycle is hidden from the driver's view by the oncoming traffic that the left turning driver is waiting for a gap in. This applies to all of the methods that use sidewalks, two-way sidepaths, two-way bike lanes on one side of the street, and bike lanes that continue to the intersection. In Figure 1, vehicles making right turns will not expect a bicycle to appear at speed from their near right. This is especially true if a right turn is made on a red light. Extra legs to intersections multiply conflicts and confusion. Trees planted between sidewalks, sidepaths, and streets hide vehicles and pedestrians from each other. Extending the bike lane on the right side all of the way to the intersection creates a conflict between right turning cars and bicycles going straight ahead. Even if the cyclist obeys the law and continuously signals a turn for 200 feet, oncoming vehicles are probably not going to expect a bicycle to turn left from the right edge of the oncoming lane. None of these wrong ways of adding bicycle lanes or paths conforms to the normal laws governing lane use and right-of-way. This will cause extreme confusion. None of these wrong ways of adding bicycle lanes or paths conforms to the Manual of Uniform Traffic Control Devices. Oncoming bicycles on the right will startle drivers, especially at night. A bicycle on the left side of a street is not coming from an expected direction, and may not be seen by drivers turning onto the street from a crossroad. This is a common cause of crashes. In order to be safe, a traffic light at any of the intersections in the above figures would have to have a special bicycle phase. Bicycles, unlike pedestrians, move too fast to be scanned for like drivers scan for pedestrians. This is the reason bicycles cannot be treated as pedestrians under the law. Approaching bicycles are in the blind zones of drivers coming from the same direction. Treating bicycles sometimes as pedestrians and sometimes as vehicles confuses both bike riders and other traffic. Notice that all of the wrong ways of building bicycle lanes and sidepaths create unexpected conflicts, bring vehicles in from unexpected directions, or hide various traffic movements from each other. These dangers must be avoided. Where there are different lanes for different maneuvers, the bicycle must either be in the correct lane for the maneuver the rider plans to make, or be in a special path that is independent from motorist paths. A bicycle maneuver must not cross the path of a car maneuver if both are permitted at the same time. 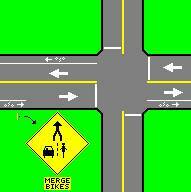 At an intersection, bicycles must either be kept completely separate from the stream of motor vehicles, or they must be merged into one stream at least 60 feet in advance of the intersection and removed from the stream at least 60 feet after the intersection (Figure 4). In figure 4, the 2 merging and 2 diverging maneuvers added are much safer than the conflicts in figures 1, 2, or 3. In any plan, bicycles must always be expected to obey moving vehicle laws, never pedestrian laws. The paths vehicles and bicycles are to follow must be clear and unambiguous. Where sidepaths are used, care must be taken to keep turning drivers from colliding with sidepath bicycles crossing their paths. 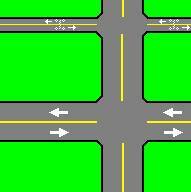 Two-way sidepaths must cross any cross street at least 60 feet away from a vehicular intersection (Figure 5). The spacing should be even farther for safety. In figure 5, the 40 conflicts at each crossing do not interact. This means there are only 80 total conflicts, rather than the 134 found earlier. With two-lane streets, a two-phase signal is sufficient, with cautionary signs warning turning motorists to yield to bicycles entering the intersection from the sidepaths. A more sophisticated system gives the bicycles their own phase, with all 4 directions of bicycles receiving greens simultaneously. If the streets have left-turn lanes, the left turns have their own phases, and bicycles go with straight-ahead phases. 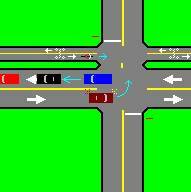 A system with all movements being protected from conflict has special left-turn and right-turn lanes for cars. 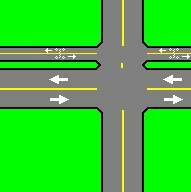 The right turns go with the cross-street left turns. Bicycles and pedestrians go with straight-ahead indications, which do not allow turning movements to go. This is the safest possible system, and takes up no more traffic time than a standard quad-left-turn signal. Trees may be planted in the dividers if either the separate bike phase, or the fully-protected movement phasing, is used. Barriers must be provided to prevent children from running into the street from the sidewalk. But remember that trees damage the pavement if planted closer than 10 feet to the road. Trees may be planted in the dividers where no intersection or driveway is within 60 feet, but only where barriers prevent children from running into the street from the sidewalk. 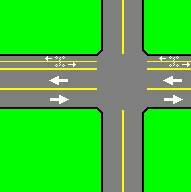 Intersections with STOP signs within a system like this must be treated carefully to avoid unexpected conflicts. There must be a means of enforcing the law on the bicycle riders. When properly done, a bicycle system improves traffic flow for both bicycles and other traffic. It is imperative that the system be designed to be safe and efficient.